After the speech has been written, the practice has been done, all that is left is for you to actually present your speech to the audience. It goes without saying that this can be one of life’s biggest challenges! * PUBLIC SPEAKING PROBLEM: TOO MANY QUESTIONS (FROM ONE PERSON)! It turns out that it really should not be. Assuming that you’ve been able to collect your thoughts, write them down, and have had the time to practice what you want to say, then everything should go ok. However, I suspect that you’d like to do better than “ok”. As long as you are taking the time to create and practice a speech, you sure want the speech to make an impact on your audience. You want to be able to deliver a great speech. It turns out that you can do this, you just need to know how to go about doing it. That’s exactly what this book is going to do. I’m going to show you what you need to know in order to make sure that your next speech is one that your audience will remember long after you are done speaking. In order to make this happen we’re going to have to talk about how Steve Jobs used to give speeches. We’re going to have to talk about your body language and what it may be telling your audience. It turns out that your posture is also important and so we should talk about that. Finally, not every speech is the same. We’ll talk about how you can get ready for speeches that you give in unique situations. In the end, you’ll have a very good insight into how you can make your next presentation the best that you’ve ever given. 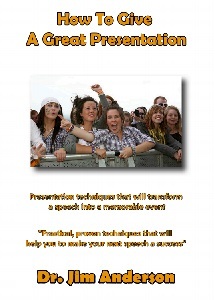 Ultimately the impact of your speech will be determined by the quality of your presentation.